SAN FRANCISCO (KGO) -- A Bay Area man hopes to be the first swimmer ever to swim from the Golden Gate Bridge to The Farallon Islands. 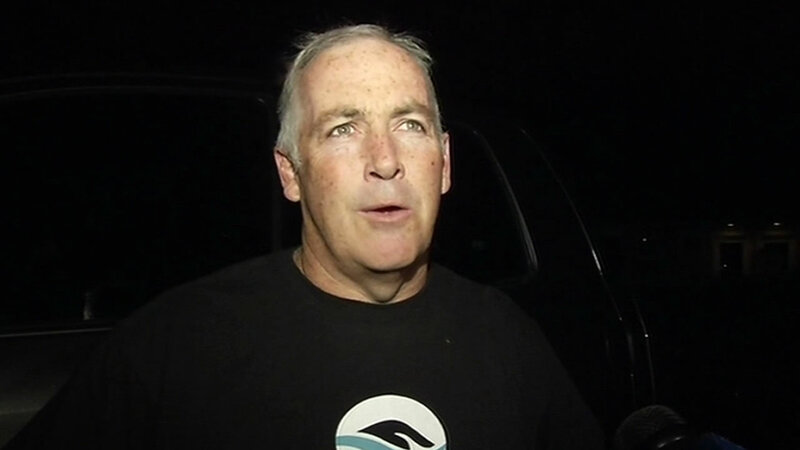 ABC7 News was in Belvedere around 10 p.m. as 49-year-old Simon Dominguez prepared to leave for his historic swim. The Corte Madera resident began the 30-mile trek to The Farallon Islands late Tuesday evening. The water temperatures are frigid and feeding grounds for enormous great white sharks. Dominguez swam the English Channel and Lake Tahoe before, but this swim is colder and more dangerous. Regardless, he told ABC7 News he was ready. He said, "I've trained for much colder water than it's going to be out there. There were a couple of jellyfish when we went out a few weeks ago, but I'm not worried about any of that. I just want to get in the water and get this swim done." Dominguez's swim will take anywhere between 13-18 hours if successful. Ironically, he hopes to celebrate with a cold beer. Dominguez had to stop his effort just three miles from The Farallon Islands, after a shark was spotted in the frigid waters, near the islands.